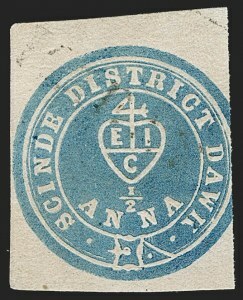 FINE UNUSED EXAMPLE OF THE HALF-ANNA BLUE "SCINDE DAWK". 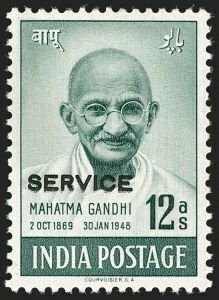 ONE OF THE RAREST UNUSED STAMPS OF INDIA OF WHICH ONLY A FEW ARE BELIEVED TO EXIST. 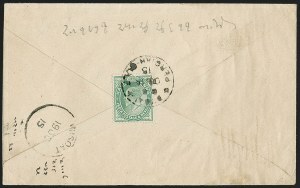 The "Scinde Dawk" name is simply because they were used in the Sindh Province and the word "Dawk" is an anglicized spelling of the Hindustani word for "Post". 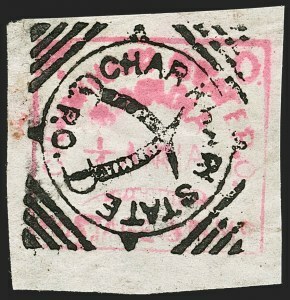 The -1/2a Red (SG S3; Scott A3) was first issued on July 1, 1852 as a wafer wax seal - the first postage stamp of Asia. 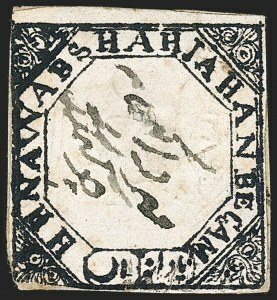 Due to the obvious shortfalls of a wafer seal, the White and Blue (SG S1-S2; Scott A1-A2) stamps were printed and embossed for use. EXTREMELY FINE. 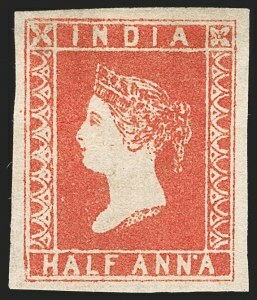 A RARE AND HANDSOME EXAMPLE OF THE HALF-ANNA IN DEEP VERMILION. Named "9-1/2 Arches" due to the number of arches in the side panel. 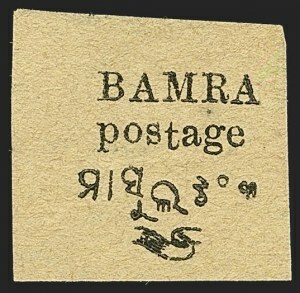 This stamp was printed and prepared for use with a supply sent to Bombay, although it was never officially released for sale. The Deep Vermilion shade offered here is rarer than the Vermilion shade which is usually found on toned paper. VERY FINE APPEARANCE. 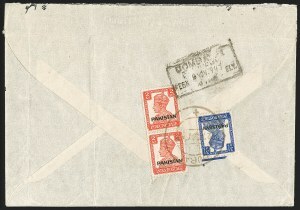 A STRIKING AND RARE MULTIPLE FROM STONE "D". 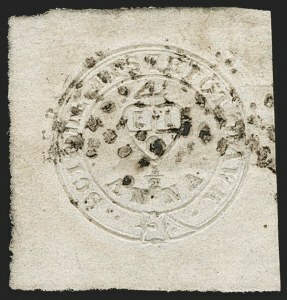 It is especially appealing to have every stamp in the block containing an identifiable plate flaw or retouch. FINE. 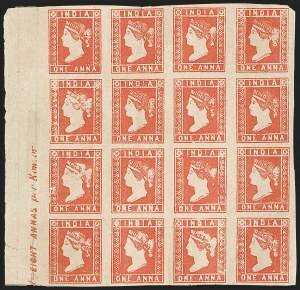 A RARE AND HIGHLY DESIRABLE PLATE NUMBER MULTIPLE OF THE 1866 2-ANNA OFFICIAL. VERY FINE. 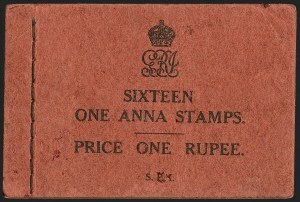 ONLY A TINY NUMBER OF UNUSED EXAMPLES OF THE 12-ANNA GANDHI OFFICIAL EXIST. 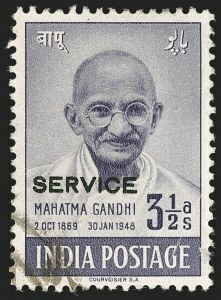 The official issue was not available to the public and only a tiny fraction of the 300 issued are unused. Many of the known examples have interleaving stuck to the gum unlike the example offered here which has full original gum.